Do you Require Real Web Traffic to your website? Do you want to Boost your website organic traffic on search engines? If your answers are YES; then click the RED "Order now" button to place your order and unlock over 100,000 unique visits to your website. Website traffic is measured to see the popularity of web sites and individual pages or sections within a site, So if you are not receiving lots of quality traffic then it all counts for nothing! You may receive sales or opt-ins but they CANNOT be guaranteed, as well as specific bounce rate time spent, and ranking. We can't control visitors' actions. 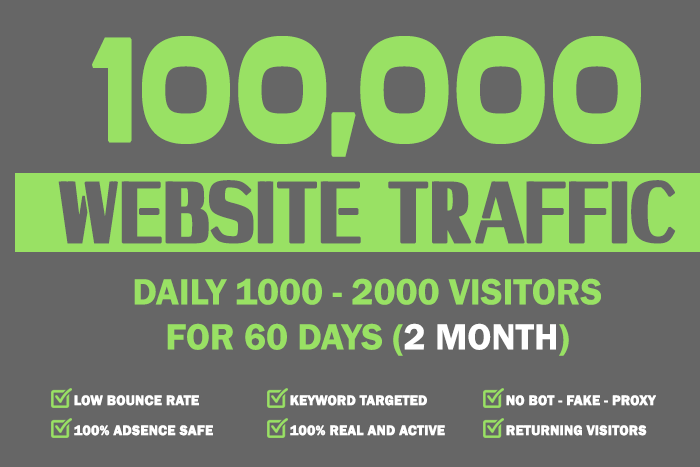 Drive 100,000 Real Website Keyword Targeted Low Bounce Rate Traffic is ranked 5 out of 5. Based on 20 user reviews.